When did Vladek join the brotherhood? Is the shield too much? I couldn't resist after seeing how perfectly it fits on his back. I'd remove those rock armor addons and rotate the CCBS shells they're currently attached to so that they are seen from the side while looking at the MOC from the front. If you can, use different armor here. It's not too bad, I guess, but those Knights Kingdom shoulders look a little weird used like that. Definitely... interesting. Looks actually quite good from the back but not from the sides. I see the problem of it not aligning well with the torso, but in my opinion using a Nuva chest like you did to bridge that gap is not a good option, either. Maybe you can figure something else out? I'll edit this later if I decide on one. Just in case - you're required to create a seperate topic with the finished MOC. Also I won't be notified if you edit a post in this topic, so when you come up with a name better post it seperately from this post. Also make sure that you have at least one front picture with the entire MOC on it. They're just rotated so it's kinda fine. What I do to fix things is opening the pictures in the correct orientation in Paint first, saving them, and then uploading them. All in all I like what I see. 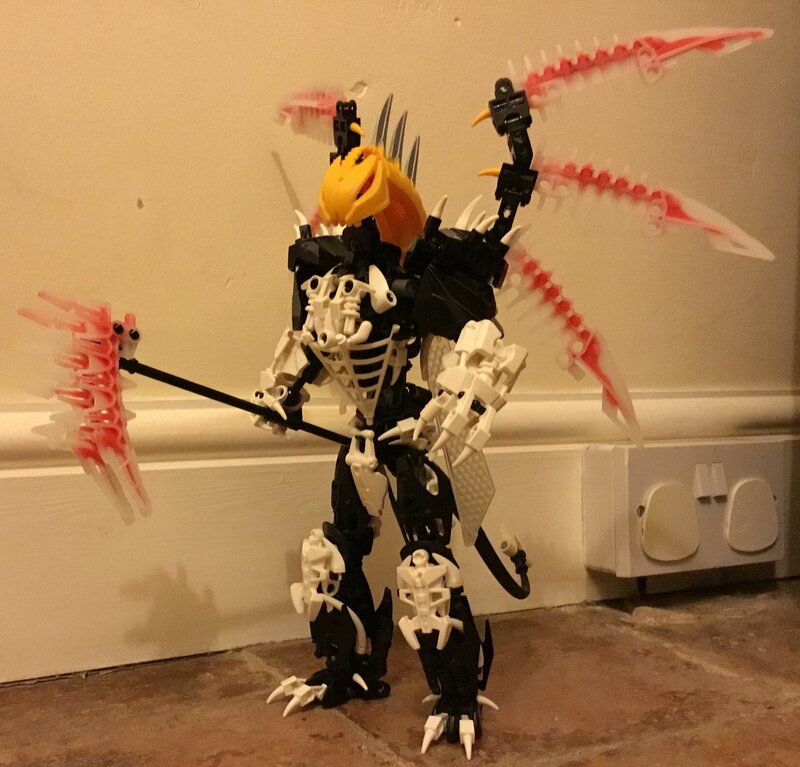 But I'd suggest making the MOC taller - presently it looks more like a Toa than a Makuta. I'd add one or two units in length to the torso and two to both the lower and the upper legs. That's definitely just my suggestion, though - the MOC definitely is complex enough to fit the project rules. Thanks for the insight! I tried extending the lower legs by a length, but they made the thighs look disproportionate, and I'm really happy with the thighs, so ended up letting it be. I did my best to make him look more regal to compensate for his stature, though, and standing next to an average Toa, he looks decently evolved in my opinion. I'll also say that I haven't found a secure way to attach the stud launcher on his shoulder, and might just take it off along with the trans-orange chain. ( I should really take better pictures; he looks quite different in-hand). The lower arms are completely a WIP, by the way. Looking good! I'd maybe leave the purple out of the colour scheme, though. Tan, silver and black are enough in my opinion. Sure, I'll take out purple. Alright, then I'll put you on the list for a non-canon male Makuta. Lots of island realms have been added for the project; I've invented a city instead. Anchredge Bay is a bustling city-port located on the northern tip of the Southern Continent, where it receives shipments from Stelt, the Northern continent from around the Peninsula, and, on occasion, even Metru Nui. Certain Matoran of Anchredge Bay are responsible for delivering these goods and shipments along the western shore of the Southern Continent (Stelt handles the eastern shore), through express waterways to their designated coastal settlements. Moreover, Anchredge Matoran utilize various inland routes that lead deep into the Southern Continent, and connect with the large cities to the west of Mount Valmai and the Deadlands that would later come to be known as Voya Nui. These inland routes are perilous, however, for the wooded hills and valleys south of the Northern Coast play host to dangerous Rahi, predatory outlaws, and, on occasion, even Dark Hunters. The Deadlands below this region are unsurprisingly desolate and harsh, and due to the nature of these conditions, Toa are regularly dispatched to accompany any necessary journeys these Matoran may make to the big cities. The seafaring trips are far safer, luckily, for the western coastline is continually monitored and surveyed, and the regular Matoran settlements along it are quick to alert. These seafaring voyages end at Kumo-Nui on the western coast (Makuta Avecious' Island, which lies just above the Tren Krom River), and Kumo Nui sub-distributes what remains to the nearby settlements. The Makuta I'm working on (Presently unnamed) oversees Anchredge Bay, and Anchredge Bay alone. There are several reasons for this unique situation. Anchredge Bay, while a secondary port to Stelt, is still a key point of access to the majority of the Southern Continent, and thus, individuals such as the Dark Hunters and Barraki might be inclined to exploit this potential. The Barraki did so, in fact, and their initial capture of the City allowed their armies to expand quickly. Moreover, the Bay is isolated due to the surrounding wilderness to the south, and due to that region's foggy, dark nature, beings unfriendly to the MAtoran, and thus, MAta Nui's mission, have ferquently gathered there across history. It is for the relative importance, high poulation, isolated geography from the other northern settlements, and precarious position of Anchredge Bay that Makuta Miserix assigned my Makuta to the city alone, and another Makuta to the broader area of the north of the Southern-Continent. What I'd definitely say, though, is that this wouldn't be an assigned region, but rather your Makuta would fulfill some form of... "ambassador" function. (Makuta Akima who is assigned to the Northern Region of the Northern Continent doesn't care too much about her assigned region anyway). So far no issues from RSG's side, although the city's name should be something in Matoran. Dope! If you or anybody has any suggestions for the name I’d be up to hear them, though perhaps it would be best to wait until I flesh out it’s history and culture a little bit, and we can base it on that. Took out the purple, and re-built the wing attachments (which you can't see from the front, but the wings are visibly higher on his back). Still not sure what to do with the lower arms. Still not sure what to do with the lower arms. A little more tan in the lower legs and the torso area would also be a good idea in my opinion. I sort of want to take one of those two spots, as I still have one slot left. Though I feel like maybe I should wait for someone else, as I’ve already made two Mocs for this project. But I really want to see the project completed! Given that your last entry looked really good, I don't have any issues with you claiming another spot, if you want? Thanks! I’ll take that spot then. Would you mind if I used my self Moc with heavy upgrades? If not, I still have many ideas left. Would you mind if I used my self Moc with heavy upgrades? As long as it looks good you can do what you think works best.